The Costa Rican food is one of the tastiest foods you will ever find in the world, its flavor is good and yummy and you just cannot get enough of it. Here we eat fresh vegetables, fruits and grains. Rice and beans are the base for our meals, we do not have like a real separation between meal times, I mean that in Costa Rica, we can eat almost the same for lunch or dinner, in some cases, for breakfast too; sometimes, foreign people think that is strange to eat plantain or avocado for breakfast or eggs for lunch as we do. 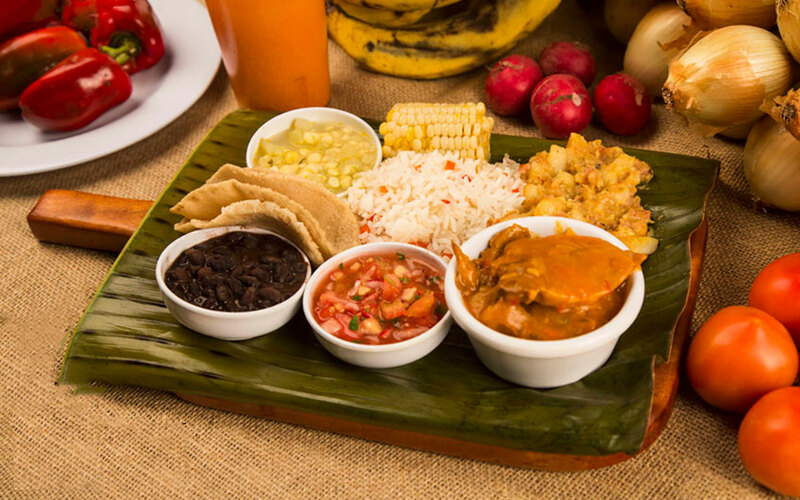 During your family trip to Costa Rica, you will see that our meals, although can look or sound weird, are delicious, featuring very tropical flavors. Let´s explore a little bit of our cuisine, so you have a better idea of what you can find on your Costa Rica vacation package. The main national dish is the “Gallo Pinto” which is use for breakfast and consists on rice and black beans mixed, and which can be combined with eggs, plantain, avocado, meat, or anything you want. This dish can be found in every inch of the country from the farthest place to the nearest one, so you better tell your travel agent before doing all the Costa Rica travel planning that you want to taste this no matter what. Sour cream is the most common accompaniment and its preparation can vary depending on the province that you will stay in, but the dish will be the same as it will not lose the essence. Here in Costa Rica people usually eat bread for breakfast too, and diverse tropical fruits can be added to the plate. For lunch, your best choice is the traditional dish called “casado”. It again consists on rice and beans (unmixed), with a few other companions; I know you are thinking you are getting the same as the breakfast but it taste different, well, because it is prepared differently. 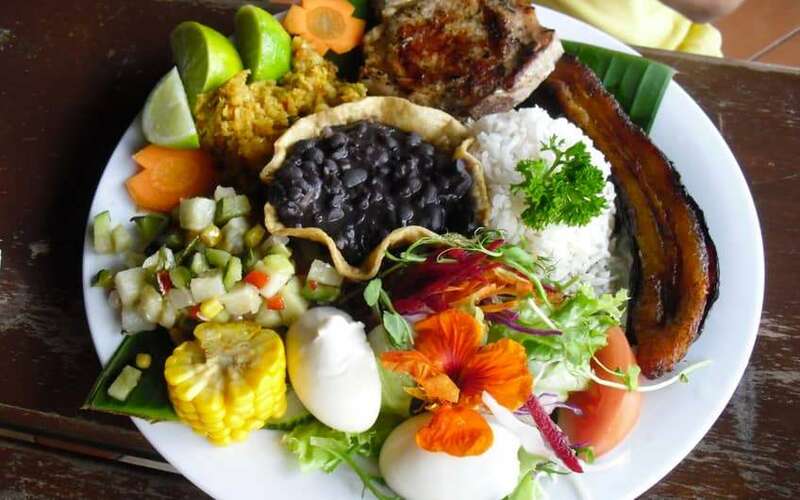 During your Costa Rica family itinerary, you will see that most of the typical and cozy restaurants to go will offer you a “casado”, a dish which is usually accompanied of meat (indifferently if you like beef, chicken or fish), then salad and a hash made of meat and vegetables. Our salad includes lettuce, cucumber, tomato and sometimes carrot and usually the hash can be made of potato or squash with beef meat. For dinner it is the same, we usually eat almost the same as for lunch. If you are staying at an all-inclusive resort, then you won’t have any problem at all when it comes to trying the typical food of Costa Rica; as they have a wide offer to satisfy the hungriest visitor. When you are travelling with your family in Costa Rica, you should eat one of our typical desserts in every destination you visit, the most common is Rice pudding, made of rice, cinnamon and milk, it is delicious, or maybe you can try a coconut caramel that is typical too or a banana bread. These are really common in all the country, but the ingredients sometimes vary. 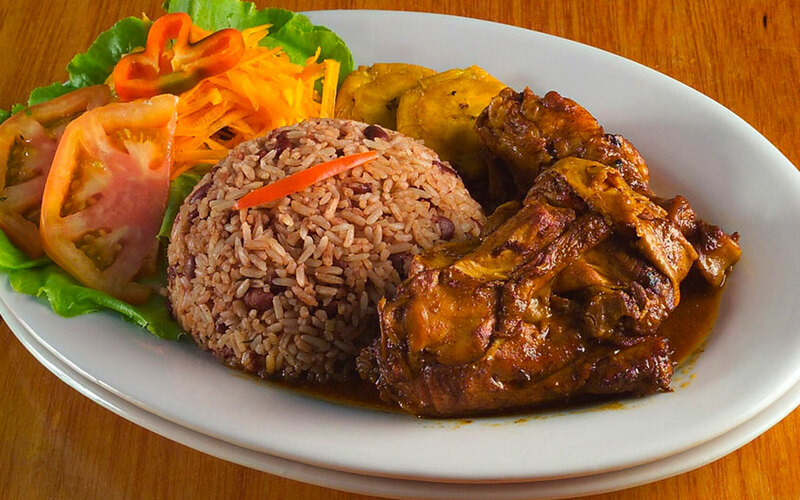 If you go to the Caribbean side of the country, specifically to Limon, you can find something similar but with a better tasty flavor, “it’s called Rice and Beans” and it’s original from that place. The beans and the chicken that goes along with it, are cooked with coconut milk to get an original delicious taste that is impossible to describe. Make sure your Costa Rica family vacation, involves tasting the Limón Rice and Beans, and believe me, you will not regret it. The flavors in Limón are more tropical, they usually eat fresh seafood, spicy and coconut milk, to put the Afro Caribbean flavor. In taverns, various small dishes named boquitas are served and are tremendous in every aspect. The Boquitas includes patacones with black bean dip, chifrijo which is rice and beans with chicharrones, which are fried pork skins, and chimichurri, ceviche and vigorón which is cabbage, chimichurri, yucca, served with a slice of lime. All these dishes are tremendous if you want to join them with a beer or a wine, so this is a good recommendation to try, during your Costa Rica vacation packages. Remember that one of our principal beverages is the coffee that is drank for breakfast and afternoon “coffee time” and some ticos like it for lunch or dinner too. During the developing of your family vacation package, you will taste one of the best quality coffee´s in the world, remember that we produce it for exportation. We used to drink tropical natural fruit juices, orange, pineapple, fruits, soursop, tamarind, blackberry and much more. If you enjoy the good nature and landscapes and amazing food in such great accommodations then you should come by Costa Rica and live the good life! Please leave us a comment about this article, and in case that you need more information, do not hesitate in contact us, we will be waiting to hear from you.